Portable sheep yards from Commander Ag-Quip Innovative Farm Equipment are an essential piece of equipment for progressive sheep farmers. These portable sheep yards are simple and quick to set up. The drawbar assembly is raised to a vertical position for operation. This ensures that the operator has easy access to the sheep and also ensures that the animals are safe. The single axle Drafting Module can carry up to 35 panels, which means it can handle 1300 head. The tandem axle trailer module can carry up to 80 panels to hold up to 2500 head. 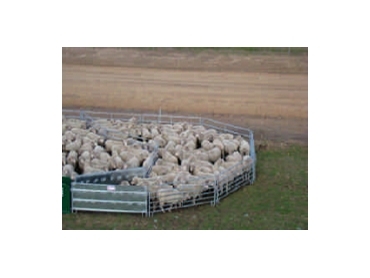 A lot of sheep farmers have reported that the portable sheep yards are particularly useful at lamb marking time. They offer a real alternative to mustering to a central set of yards where disease such as tetanus may be present. Commander Ag-Quip offers a design service as well as reliable after sales service.